$6 kids, can take an hour. I twist amazing animated balloon characters for fairs and festivals as well as birthday parties. I also walk on stilts and entertain for outdoor events as well. I have a 10 foot tall Cowboy Clown who towers over people and spins a lasso rope like a real cowboy, with a personality as big as my hat! Oliver was a big hit at our party. The kids loved him and we will definitely be using him again in the future. Oliver was a hit at my 4 year olds birthday party! There was lots of laughs from both the kids and the adults. 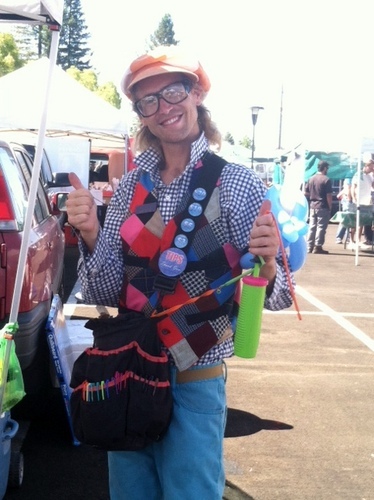 He did magic, juggling, and made balloon animals. He interacted with the kids during the show which added to the fun. Price Range: $6 kids, can take an hour. Currently, I am a 10 foot tall "Sherif" who spins a Lariat Rope, and takes pictures with folks. I can create a character specific to fit your event's theme such as Uncle Sam, Frankenstein's Monster, a Giant Basketball Player, Tin Soldier, etc. 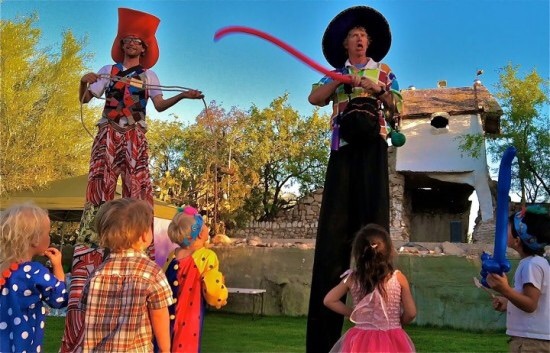 I can also walk stilts and twist balloon hats which works great for Music Concerts and Outdoor Festivals and ads some serious fun and excitement. 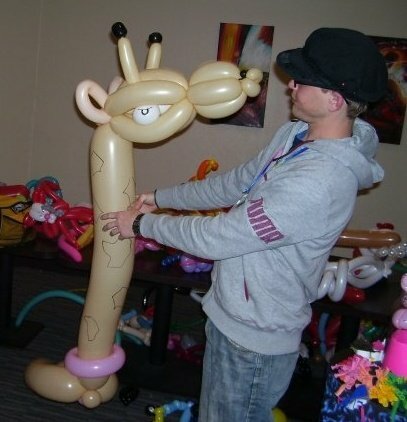 I make amazing balloon sculptures face to face with my wide eyed audience. It is very exciting, interesting and interactive, often drawing large crowds. I'm proud to say that my balloons are made of natural rubber and are biodegradable. The complexity of my creations varies from simple shapes such as puppy dogs, kitty cats, pirate swords, etc, to highly animated and specialized characters such as the Rasta Bob Marley playing guitar or Yoda yielding his light saber. I'm comfortable working under pressure and can twist very quickly if need be, although with large crowd, I like to keep it simple to make sure everyone who wants something has something to take home with them. A real Son-of-a-Clown! My father trained with Ringling Brothers and Barnum & Bailey Clown College, and has been performing my whole life. My father would perform for birthday parties and corporate events, and I would assist him in his shows and being a part of his act. When I was 12, I started twisting balloons in restaurants and for street fairs. Taking ballooning very seriously, I made my own renditions of the simple shapes my father taught me and made highly animated sculptures that look cartoonish. I joined the Tucson Arizona Boys Chorus and learned how to sing, dance and spin a lariat like Will Rogers, gaining valuable stage presence and discipline. We got to go on several tours, both in the states and over seas to China, Viet Nam, Thailand, Taiwan, as well as Chile, Argentina, and Uruguay all to the fret of most of my high school teachers. 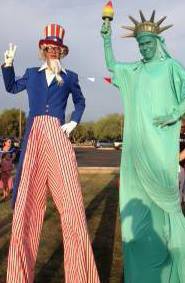 In 2011, I started walking stilts for Jimmy Buffet's Margarittaville in Phoenix and in Las Vegas as well as on the East Coast for Myrtle Beach's Freestyle Music Park (formally known as the Hard Rock Park), and have really developed a passion for the alter ego I become as a ten foot tall character. I've taken my rope spinning skills to the stilts and created a larger than life cowboy who is loads of fun, and folks will remember for sure! I also have performed as Uncle Sam for many 4th of July parties and have walked in parades and for outside fairs and festivals. Usually I can get up on my stilts in the parking lot. However, sometimes, I need a staging area to keep my costumes, change, and get up. I'm used to taking regular planned breaks, which allows be to perform much more lively. My Dad, Will Rogers, Ed Chee, Vera Stalker, all the great Rope Spinners, Balloons Twisters and Clowns out there. Thanks guys! Ladder or 5-6 foot "perch"